"Chongqing is the birth place of the hot pot in China. Once upon a time, it was a seasonal food designed to protect against the low temperatures and frigid winds of the winter. People would sit around a table, eat hot pot, and revel in the instant warmth that would flood their bodies. 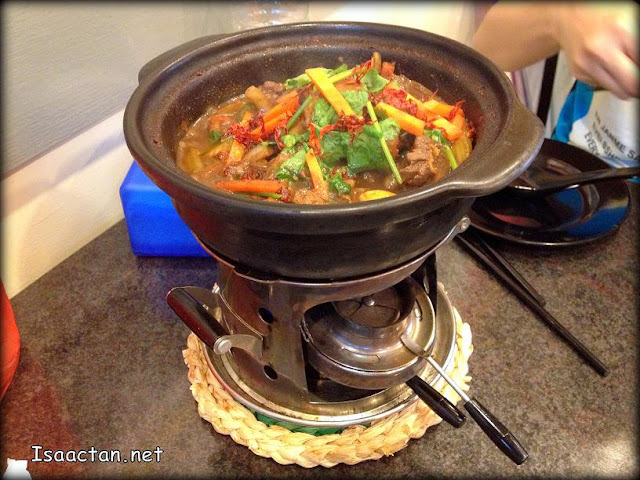 Hot pot has become more and more popular today, and it is widely enjoyed by people and regardless of seasons and regions." I would think this is the perfect dish to have on a cold rainy day, as Janice and I ordered the Spicy Chicken Hot Pot to share. Served in a hot pot, with continuous burning fire below it, the dish itself came looking really colourful with the carrot and vegetables on top of the chicken pieces. Personally I liked the soup, when boiling hot it does tantalize your tastebuds with its spiciness. The chicken pieces were a tad too small though. It was interesting to note that no gas is needed to maintain the fire, as the blue flames came from these flammable stuff which I have yet to find out what it is. 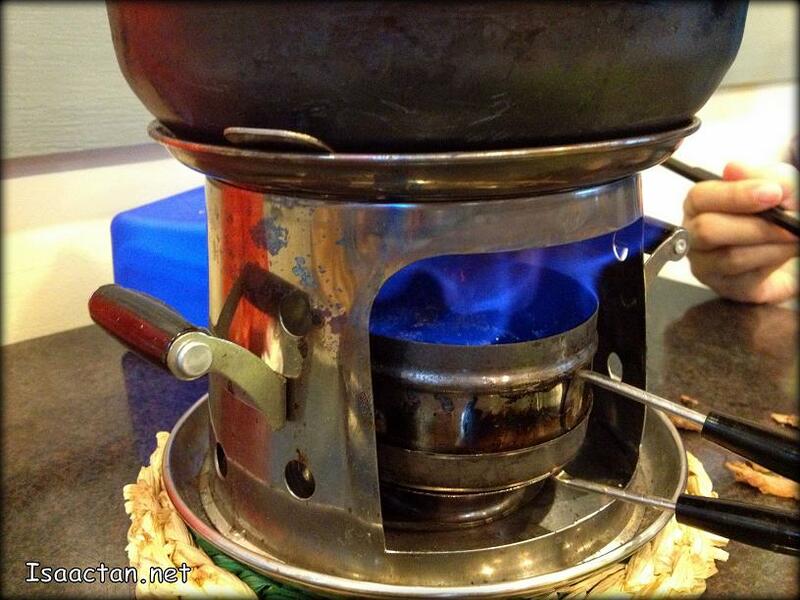 The fire maintained it's intensity throughout the meal, ensuring our soup is always boiling. Here at Chongqing Chicken Hot Pot restaurant, on top of the mains, there was a fridge filled with side dishes comprising of baskets/bowls of vegetables, bowls of pork /fish balls, noodles, mushrooms and beancurd. 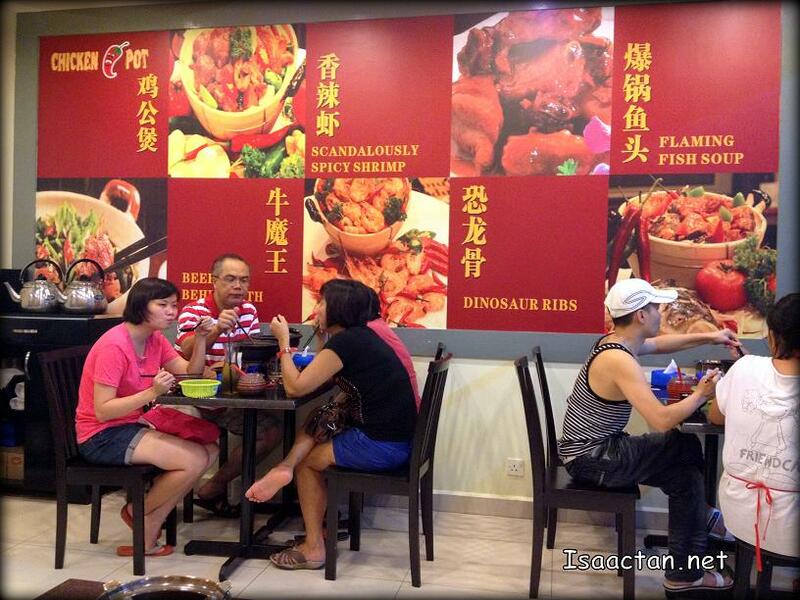 Each side dish had a price ranging from RM1 to RM4, which goes well with our main hot pot. During my meal there last night, we were given a complimentary basket of vegetables, much to my delight. Overall it was a pretty good meal, one which may not suffice if you are a big meat eater, as the size of the chicken meat were really small. You could however drink the boiling hot spicy soup until you are full, as free refills were given. 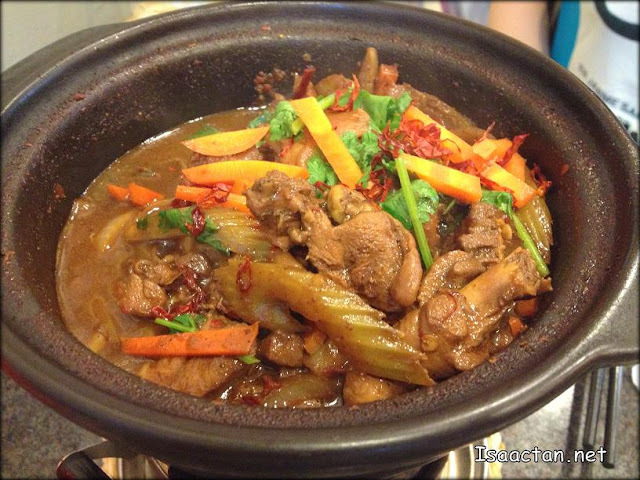 Do check out the latest branch of Chongqing Chicken Hot Pot should you be in the vicinity of Desa Setapak. Interesting that they use claypot to be the hot pot. Nice! Hopefully, no msg overdose. Usually the case in Chinese restaurants. I'm very sensitive to it now - been cutting down on it or doing without msg in my food these days. lol ehh im more interested at the dinosaur ribs!! pork rib or what? The auntie with blue pant.......really enjoy her meal.